— This article by Jerry Cates was first published on 23 October 2015, and revised last on 14 April 2016. © Budsinthenews Vol. 6:10(9). The plant we know as cayenne pepper is a cultivar. In other words, it is one of several varieties within a group of plants that was subjected — at some time in the past — to a process that determined the plant’s present characteristics. That process is a form of genetic selection, and the characteristics selected for are such that they can be maintained, in future generations, by ordinary methods of propagation. Selection can, and regularly does, occur in nature without man’s assistance (i.e., natural selection, as famously described by Charles Darwin, in his 1859 work, On the Origin of Species). It can also take place manually, as Gregor Mendel demonstrated (in his experiments between 1856 and 1863, which in only seven years of experimentation managed to establish many of the rules of genetic inheritance that remain in place today), and as many primitive and sophisticated cultures have done for millennia. The process of selection that cayenne pepper underwent was almost certainly carried out by man, over a period of multiple generations. Here’s how that works: a progenitor species with a genetically diverse offspring is sown in a garden. Only those offspring that best display the desired characters are allowed to go to seed. That seed is then sowed, and used to produce the next generation. With each new generation — especially at the beginning of the process — the desired characteristics are displayed by more and more offspring, and the qualities of those characteristics become more pronounced. At first glance the manual form of genetic selection may appear to require mediation by an unusually intelligent Selector (e.g., Gregor Mendel) either with a particular set of characteristics in mind, or with the goal of capitalizing on the best characters that are displayed as the process is carried out. Such a Selector would consciously repeat the simple steps outlined above for as many generations as are needed to ultimately produce a variety of the original plant that displays the characters the Selector prefers. However, none of this — mediation by a conscious, highly intelligent Selector, a predetermined set of desired characters, or an overt intent on the part of the gardener to improve on the native characters of the plants under cultivation — is really needed. In fact, it is likely that in the vast majority of man-mediated plant selections that have occurred in the past, not one of these was involved. Plant domestication (the planting and tending of seeds or sprouts in a protected garden tended by man) is what drives the transition from hunter-gatherer societies to agrarian lifestyles. Every such transition is, of necessity, accompanied by the prosecution of some kind of plant selection. The actors in the ensuing drama most likely play their roles without giving much thought to the consequences of their actions. Here’s why even the most primitive manual methods of genetic selection often work wonders: Gatherers of wild plants generally take only those specimens whose fruits are the sweetest, largest, and have the best color. Even children do this, not because they consciously seek a part in the heady work of genetic selection, but because (1) they are attracted to the sweetest, largest, best colored fruits in the wild, and look forward to feasting on them, and (2) they want their elders to smile upon the bounty they gather. The sting of criticism that comes from bringing puny, diseased, or colorless plants back to camp from a gathering exercise teaches the gatherer to select only the best of what they find in the wild. Back at camp, after the previously gathered plants have been eaten, their seeds are saved and planted in the camp’s garden. After the seeds take sprout only those with the healthiest stems, leaves, flowers and fruit are allowed to grow, while the rest are pulled up and discarded. Again, even children know the importance of doing this (as they usually are tasked with the work of weeding the garden and plucking out the least healthy and puniest sprouts). Their elders have explained to them that this gives the choicest plants in the garden more room and a greater share of the garden’s fertilizer and moisture supplies, and thus produce the sweetest, largest, best colored fruits of all. As that rote process is repeated, each time with perhaps no concerns by the gardener beyond the produce that will be harvested on the very next cycle, every new generation of fruit from that garden tends to express the favored characters — characters like size, juiciness, sweetness, and color that generate approbation from the clan — more and more. Eventually a state is reached at which few if any added improvements will be reached in successive generations for that particular plant. At that point a genetically pure variety has been developed. Thus, as the result of just such a process as that, cayenne pepper became the cultivated offspring of a wild pepper plant progenitor that initially looked almost nothing like what cayenne pepper looks like today. The precise identity of that wild pepper plant is not known with certainty, as the selection process it underwent took place under the auspices of a number of primitive cultures, none of which — for reasons already explained in the foregoing comments — kept formal records of the selection process that survive to the present. Still, several candidates for that progenitor appear to be very likely. Of those candidates, most authorities give the wild American bird pepper (Capsicum annuum var. glabriusculum), top billing. The expression “bird pepper” is a reference to the fact that birds, which are not affected by the hot flavor these peppers often possess, consume its fruit and pass the seed intact. This allow them to excel at spreading viable pepper seeds abroad in their droppings. C. a. var. glabriusculum is an open-branched weed found throughout southern North America, northern South America, and all regions of the Americas in between. Its fruits are small globes, less than a centimeter in diameter, positioned at the tips of each branchlet. Most of us look at this plant, and its fruit, with disdain, but early cultivators did not have today’s cayenne and bell peppers for comparison, and the early cultivators found those small globes tasty enough to gather and bring back to camp, unconsciously beginning the process of producing what we have in the way of pure lines of a long list of pepper varieties. Eshbaugh refers to this primitive plant as Capsicum annuum var. aviculare, but the varietal epithet glabriusculum, applied by Charles Bixler Heiser and Barbara Pickersgill, is today given priority. Other cultivars in this group include bell peppers, jalapeños, paprika, and a long list of other peppers with interesting names. Cayenne itself occupies a prominent spot in the lineup, being a famously hot chili pepper mostly used as a culinary spice to flavor dishes. It is named in honor of the city of Cayenne in French Guiana. Cayenne fruits are generally dried and ground, or pulped and baked into cakes. The cakes are ground into a powder, and then sifted, to make the culinary spice. 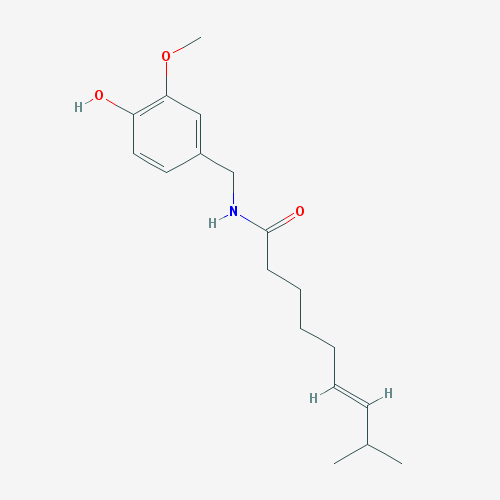 Capsaicin, (E)-N-[(4-hydroxy-3-methoxyphenyl)methyl]-8-methylnon-6-enamide, is a neuropeptide releasing agent selective for primary sensory peripheral neurons. When used topically, capsaicin aids in controlling peripheral nerve pain. It has been used experimentally to manipulate substance P and other tachykinins. In addition, capsaicin may be useful in controlling chemotherapy- and radiotherapy-induced mucositis. Capsaicin ( (E)-N-[(4-hydroxy-3-methoxyphenyl)methyl]-8-methylnon-6-enamide) is the active component of cayenne pepper. The chemical is highly irritating to mammals, including humans, for whom it produces a strong sensation of burning upon contact with any of the tissues of the body. In birds, however, the tissues lining the digestive tracts are unaffected. As a result, wild mammals (whose habits of masticating the food they eat acts to destroy the seeds) are deterred from consuming the peppers, while birds, which are free to do so with impunity, consume them with glee. This finding gave rise to the belief that wild chilies developed their hot constituents (i.e., their capsaicinoids) as a means of assisting in their propagation by deterring consumption by mammals, and encouraging consumption by birds. However, that belief fails to explain why many wild chilis are lacking in capsaicin, yet still manage to be propagated without difficulty. More recent research, by Tewksbury and others, suggests the capsaicinoids in peppers actually evolved for an entirely different purpose, specifically to inhibit the growth of fungi. While the primary function of fruit is to attract those animals that most likely to disperse its seeds in a viable state, the fruit’s nutritional rewards also attract seed predators that destroy, rather than disperse them. One example of unwanted seed destroyers are microbes, including fungal spores. The bitter, even toxic chemicals naturally found in some ripe fruits have been cited as evidence for the evolution of anti-microbial defenses. Such theories have suffered, however, from a lack of scientific evidence that shows how and why microbes might influence fruit chemistry in wild populations. Tewksbury’s research, which focused on wild chilies, showed that chemical defense of ripe fruit varied in proportion to the risk of microbial attack. Capsaicinoids are the chemicals responsible for the well known pungency of chili fruits. Tewksbury analyzed specimens of a specific wild South American chili, Capsicum chacoense, to determine if the production of capsaicinoids in that plant displayed a geographic variation that could be linked to variations in the damage caused by Fusarium semitectum, a primary cause of predispersal chili seed mortality. Capsaicinoids effectively protect chili seeds from Fusarium. Certain hemipteran insects, which feed on chili pods, aid the entry of Fusarium into fruits. They do this by punching holes in the outer skin, through which Fusarium spores can mount an invasion. What he found was that, in geographic regions where these hemipteran insects are sparse, the levels of capsaicinoids in the wild chilis is correspondingly low, but in regions where such insects are abundant, those levels of capsaicinoids increased in proportion. His conclusion, that the pungency in chilies may be an adaptive response to selection by a microbial pathogen, supports the notion that microbial predators have an influence on fruit chemistry. 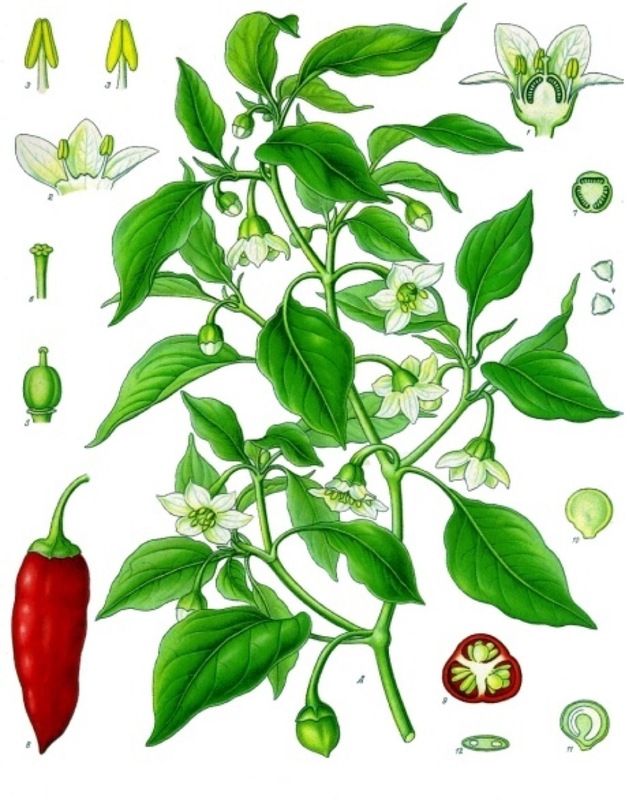 Thus, it is quite likely that the hot taste of chili peppers is a direct result of the effectiveness of capsaicinoids as defenders against fungal infections, and the consequential increase in the chili’s ability to propagate viable seeds even in locales where Fusarium and other forms of predatory fungi persist. Bosland, Paul W. 1996. Capsicums: Innovative uses of an ancient crop. p. 479-487. In: J. Janick (ed. ), Progress in new crops. ASHS Press, Arlington, VA.
Eshbaugh, W.H. 1993. Peppers: History and exploitation of a serendipitous new crop discovery. p. 132-139. In: J. Janick and J.E. Simon (eds. ), New crops. Wiley, New York. Tewksbury, Joshua J., et al. 2008. Evolutionary ecology of pungency in wild chilies. Proc. Nat. Acad. Sci., USA, v.105(33).